Well, hasn’t it been an eventful first couple of days of the Trump presidency? 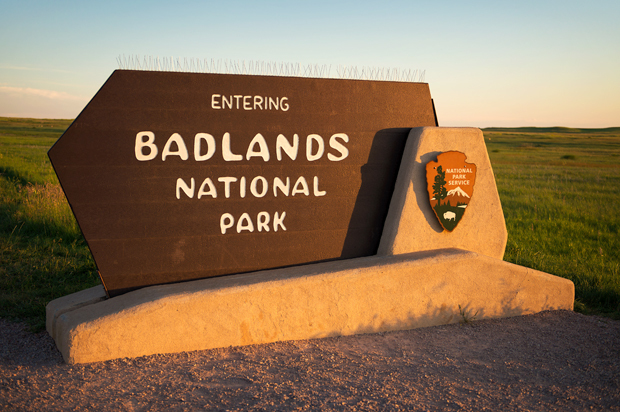 Executive orders flying like off the table like a dominoes’ pizza restaurant, gag orders, alternative facts, and of course as of early Wednesday, the Badlands National Park twitter account defying Donald Trump and going rogue. For those living under a rock, the EPA was silenced by Trump and his administration after some unTrumpian tweets were sent hours after Trump was inaugurated (facts? alternate facts?). 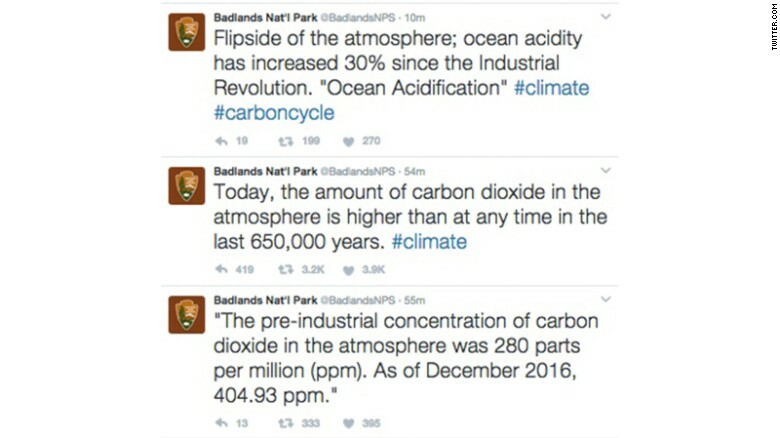 Early on Wednesday, Badlands began to post climate change related facts, which clearly do not align with the new administration’s game plan. The tweets were eventually deleted, and were blamed on a former employee who hacked the account. Regardless of it being a hack or not, this brings up a great topic for student affairs professionals- is it ok to go rogue against institutional norms, or even a supervisor that you disagree with? You betcha. CHANGE IS SCARY, BUT IMPORTANT: I’m very transparent about who I am as an administrator in student affairs. I push boundaries, and I challenge norms. It has largely been the reason why I have been successful. It is important as higher education professionals that we keep in the “now”, know what is trendy (hello pop culture), and don’t be afraid to try new things. When done correctly, change is a powerful tool that could benefit your students and co-workers. DIG YOUR HEELS IN AND DON’T BE AFRAID TO PROVE PEOPLE WRONG: One of the firs t major changes I brought to my previous institution was a full revamp of the leadership retreat that Student Government held each year. I took a very popular retreat (for which I believed was popular for wrong reasons), ended it and re-built strategically from the ground up. To say the least, I was initially met with push back. By the end of my time at the institution, the new leadership retreat structure was an institutional norm. We must be confident in our knowledge and ability to judge what is best. Change doesn’t happen overnight, so take your time, and be thoughtful in your approach- but be confident that it is the right approach. FEEL FREE TO DISAGREE: It is ok to disagree with your supervisor. Unfortunately, not all institutions offer the ability to converse about ideas and opinions, and some supervisors are downright ignorant to views outside of their own. The current climate in the US has many people worried that we are slowly marching in this direction. When push comes to shove, if you do not have the ability to oppose thoughts and views of your boss, I’m not sure if that is the right place for success. As professionals we must do our best to provide an environment where all thoughts and opinions are heard, and the same should be done in professional circles. If something doesn’t make sense, or you disagree, voice your opinion. One of my early career defining moments was standing up to a boss- and it opened the door to opportunity. INNOVATION IS SUCESSS: In our profession, unfortunately people become comfortable and stagnant. Don’t be those people. Innovation will make or break our industry, and you absolutely want to be on the right side. Innovation is everything I have mentioned wrapped into one- bringing something new to the table could show off your diverse skill set, or even encourage others to do the same. GOING ROGUE ISN’T EASY…AND IT SHOULDN’T BE: You all might be reading this article and thinking, how I still have a job. Being a change agent is not easy, and it never will be. But I know for a fact that my career would be very different if I didn’t make certain decisions along the way, or not be afraid to be bold. Being a successful rogue agent in student affairs requires tough skin, resiliency, and the want to be a true impact. New ideas may not always work, but what counts is your attempt to try, and having the ability to step back up and go back to the drawing board. We are in uncharted waters as a country and as an industry. Now is not the time to go by what is stated or pushed as normal. Intentional or not, the Badlands twitter account disrupted the norm. As my great colleague MrJeffDess often points out, if we don’t disrupt the system as educators, then who will? The cable news world was turned on its heels this week with the news that long time conservative talk show host Megyn Kelly traded in her digs at Fox News for a brand new opportunity in a very different environment at NBC- which is arguably one of the most liberal news outposts today. As higher ed professionals, we can learn something from Megyn’s job change, which was undoubtedly not decided on the flip of a coin. As we advance in our career, sometimes we are faced with a choice that involves moving from a position or institution that we are comfortable in to a new challenge that may very much be outside of our comfort zone. In my nearly 10 years of higher education, I’ve had a chance to take advantage of opportunities that have consistently challenged me. After graduating in 2008 from a small, private liberal arts institution in New York City, I began my professional career in admissions and enrollment management at a moderately sized non-religiously affiliated university in NYC that had historically served at-risk and minority populations. In 2013, I made the move into student affairs by joining a medium sized public state school in New Jersey that focused on a similar population as the prior. In June of 2016 I made the big decision to accept a position in graduate student affairs at a large, ivy league institution in New York City. My most recent shift has been a challenge- working with graduate students and in an environment that I have never previously been a part of has been eye-opening, but something that I know I am benefitting from, and was the right choice for both professional and personal reasons. Never change you- This is the golden rule. There are people who are wondering how Megyn is going to adjust or change herself from being on what is considered a conservative network to now being on a liberal one. In reality, what should be accounted for is the fact that Megyn is a great journalist and has the skillset to apply in any environment. Our values, ethics or beliefs should never change regardless of where we are. You were clearly picked for your new position for a reason, and shouldn’t require a personality change. Be open to a different environment and what comes with it- While you shouldn’t change your core, you will have to be open to an environment that is drastically different than where you have come from. Your skill set will also appropriately have to adjust. My move from undergraduate student affairs to graduate student affairs have caused me to re-evaluate how I’ve approached situations in the past, and how to tweak my skill set to be successful. Megyn will have to do the same- realize that she will now be broadcasting to a new audience, and how she can use her knowledge to apply. Accept feedback and constructive criticism- In higher ed, feedback can happen on opposite sides of the spectrum- sometimes never, sometimes too much. In a new environment, you will have to be ready to accept both. I quickly learned with graduate students that directives I had given prior that were taken without question were quickly pulled into the limelight and constantly questioned- it happens. Ultimately, it is great for growth and should almost always be welcomed if done in a positive light. Don’t second guess your decision at first challenge- It is only a matter of time before you have your first negative interaction with a student or colleague at your new institution. Don’t let that interaction send you on a road of doubt. Megyn will eventually have a comment said over social media, or otherwise that may or may not make her re-think her decision to join NBC. Always remember that you are the expert, and in your new position because someone saw value in you- and that everything is a teachable moment! Consider yourself- In any life change, always remember it is OK to keep yourself at the center of any decision. You have many things to consider in changing jobs- family, location, salary, etc. In the end, if the position does not satisfy every question you have, nor fits your needs and wants- it might not be your best fit. In the world of student affairs and higher education we often rely on assessments and numbers to make decisions. It’s not only this field but, in so many others we see the rise in importance of analysis and analytics. I’ve read think pieces about how amazing Obama’s legacy is. I’ve read essay after essay about how problematic of a president he is. I watched television specials and 24 hour news channels discuss the numbers equated to his either dismal or tremendous time as president. All those points are key, but there is an essence often overlooked and that is “the feeling.” I’ve got plenty of issues with Barack Obama’s presidency but last night, I took a moment to appreciate the actual moment he represented. As an educator who trains, hires, advises and works with student leaders, I am always looking at the stats. What is their g.p.a? What year do they graduate? How many credits are they taking this semester? Have they been involved in any disciplinary issues? As an administrator I am continually defending my actions through assessment. I’m asked to justify the budget or find out if any other institution has done what we’re doing. As integral to the process as all of these inquiries are, I am a believer in life and as a professional that we have to take a deep breath and enjoy the moment. This doesn’t mean we use the moments to define or dictate our decisions. It means appreciate, even if it’s for just a second then move forward and decide. Immediately after and to be honest even during the speech, I was analyzing every word; critiquing all my oppositions and affirming all the positive. CNN, Fox News and others were dissecting the speech as if it was an NFL playoff game. I was pulling out my notes, looking up articles and wanted to join in but then, the moment hit me. I, too want to always look at the numbers but sometimes you miss out on something special. I won’t miss the housing crisis in the black community, drone strikes or racial tension with law enforcement but I will miss the moments. As a black man, seeing a black family in the White House was special. Their outward grace and swag was a thing of beauty. But here’s the thing, moments do not last. We can’t live off of symbolism. The work has to be done and we have to do it. One thing that stood out from the President’s speech last night was when he said, “I am asking you to believe. Not in my ability to bring about change — but in yours.” This brings me back to my students. As educators, we have to push these young folk to be up to the task. It isn’t simply about us making change, it is about them reshaping and creating new definitions of the word, change. We are not the stars of the show. Their work is what will transform the world. Trill or Not Trill was created as a platform for dope educators but more so for popping students to express their voices of change. It’s about disrupting the norm and nobody can do it more than this generation of young people. They need us to embrace and engage in their moments but more importantly drive them to #DoTheWork. This goes beyond the classroom or campus. It starts with the communities. Bring out the writers and musicians. Calling out the scientists and business owners. We have to disrupt our fields and can’t rely on Barack Obama or Donald Trump to do it for us. We should have never relied on the office of the President as much as we should always be relying on ourselves. 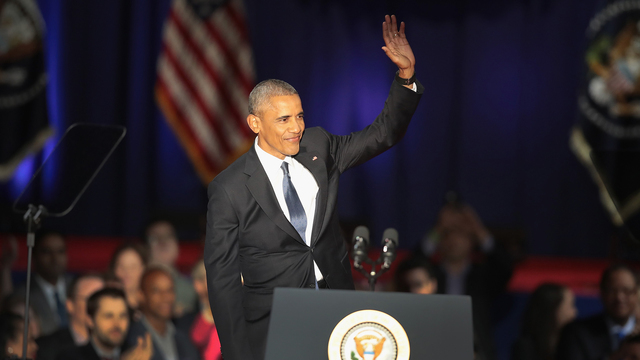 President Obama also said, “If you’re disappointed by your elected officials, grab a clip board, get some signatures, and run for office yourself.” If running for office isn’t for you, go find something that is. There are still people in Flint who can’t drink water and there are still kids in Queens who need after school programs. We need mentors and we need change agents.Once you’ve finished posting your pics of Barack and Michelle on Instagram go out and directly impact someone’s life. My higher ed folks, your students may not be back on campus yet but don’t wait. Start the planning the movements now, if you haven’t already. Thank you, Mr. President for the moment. Thanks for having Kendrick Lamar and Janelle Monae perform in your home. Thanks for playing horse with the UConn Women’s basketball team. Thanks for showing us that you know how to give a proper dap. Thanks for appreciating those wonderful black daughters and amazing black wife in the White House. It was something we’ve never seen before. All that was really cool, but MOST importantly I want to thank you for continually reminding me that the real work comes from us. The monument of the first black president is tremendous but the movement of the people matters more. My fellow educators, it’s time to get back to work. During this past weekend’s Golden Globes there were a few memorable moments. You knew that once Jimmy Fallon’s teleprompter stopped working during his monologue, it was going to be a special night. We even saw SpiderMan and Deadpool make out during Ryan Gosling’s acceptance speech. But one of the most monumental moments of the night was also the most controversial and talked about speech of the night delivered by Meryl Streep. After accepting the Cecil B Demille award for lifetime achievement she spoke for more than 6 minutes about our many things including, President-Elect Donald Trump. What I thought was important about this moment is that she used her platform on a stage that was filled with influential celebrities, directors, writers etc. There’s a lesson that can be learned here about how to use your influence to make a change. This is not limited to politics but also among your student government clubs, Greek organizations and even your neighborhood. Here are a few tips you can learn from Meryl Streep’s speech. It’s true. We all have different platforms in different parts of our lives. You may be more influential in one part of it and not others, but we have it. 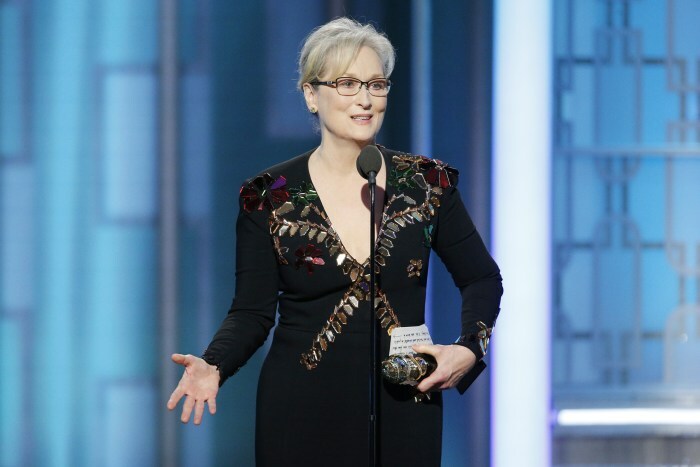 This was the perfect timing for Meryl Streep, an actress that has been relatively active in politics, accepting a lifetime award on the Golden Globes that had 20 million viewers. Understanding that timing is essential, she used this moment to deliver the most impeccable speech. Find your platform and figure out where it can work the best. If you are in a Greek fraternity/sorority you will have more pull with those organizations than you may have with Student Government. Use that to your advantage and find others that have platforms that can help you in your journey. Your platform may also simply be a characteristic you were born with such as gender, race, and sexuality and so on. These can be used as platforms to help spread a message you are passionate about. Anyone that won an award that night could have made that speech, or at least commentary about the state of the country. No one else did. That’s because it takes a special kind of character to call people out on a stage that large. Even when you have your platform sometimes it is either used improperly or never used at all. Some platforms are earned while others you are given but they are worthless if they are not put into action. She was fearless in calling out Donald Trump but she did it strategically. She never actually attacked him. She talked about how his actions hurt her. She made it about herself and her feelings. This is Communication 101. When calling someone out it is best to tell them how their actions may have hurt you or others. Using statements such as “You are incompetent” is much less effective than explaining their action and how you feel about them. But don’t be afraid as you there are people that will feel just as you do that will support you. This is one of the most powerful quotes that she uses in her speech that meant the most for me. Take a second to reflect on the leadership around you. If you are the leader reflect on yourself. What is it that is being promoted? What is the message that is being told? Being a leader comes with a ton of responsibility because of the influence you hold. I have worked in places where co-workers gossip and hardly interact and others where people enjoy their work and are efficient. These cultures start with leadership. The platform in which you sit on is a vehicle to those you influence. When you are a leader you set that standards for your followers, employees, club members. Be sure to do it wisely. Towards the end of her speech, she asks for the help of her fellow actors. She tells them about the influence they hold and how they can help in creating outrage. The great thing about that moment is that the audience to whom she is speaking to has a very similar influence in society. They can take the same actions on their own platforms to ignite change. Work with those that may be in the same position as you are and ask for their help. It is easier for those that hold the same platform as you to relate to you. Look for other club presidents, same-level administrators, co-workers to take a stance with you. Those who are unwilling to take the first step will often do it with someone they trust. I saw the speech by Meryl Streep as inspiring for me as someone who is passionate about social justice and culture change. I hope that wherever you are, you begin to think about how to use your privilege, platform and influence to make your place even the slightest bit better. Atlanta was easily one of the trillest tv shows of the year and the Golden Globes rewarded them. Donald Glover won for best actor in a television series and the show took home best comedy series. The actor and MC took the mic and dropped some gems within both acceptance speeches. There were four specific moments that stood out for me. Glover took us back to some childhood moments when he said, “I grew up in a house where Magic wasn’t allowed.” This poetic statement reminds me of how much extra work we have to do at times. Push your students to find their own magic within. Don’t try and stunt their creativity. Your students are going to want to try new things.They’ll bring new ideas to the table and you should let them serve those creative juices. I’ve sat down with students who have brought non traditional suggestions to me. Initially, it might sound a bit out of whack but that’s what education is about. It’s about letting the magic happen. They might be scared at first to take a chance or trust their own amazing ability but that is were we come in. Allow for those spaces to be explored and cultivated. Some of the greatest moments or programs happen when the excitement flows and is allowed to be expressed freely. Glover added, “My dad used to tell me every day, You can do anything you want.” Even our best most confident students will run into a roadblock throughout their academic careers. They might have doubts about graduation or selecting their major. There may be fear to run for president of an organization or applying to a particular job. We have to make our students believe in their own greatness. Push them to believe in all the possibilities that are out there. Let your students know that their potential is limitless. At times, we have to be the parents or the coaches. We are the mentors who just as Donald’s dad told him, must remind our students that they can do anything they want. praise, he said ” I really want to thank Atlanta, and all the black people in Atlanta.” This reminds me that we have to fully embrace our student’s cultures, races, and identities. Allow them the space to be proud about who they are and where they come from. I also push my students to learn and discover more about their cultural backgrounds. I was an undergrad when I learned the most about Black culture. It helped shaped the person that I am today. I push my own Black students to learn more about the Harlem Renaissance. I encourage my LatinX students to discuss the complexities of Fidel Castro. I ask my Filipino students to learn more about their historical background in America. Find out more about their musical stars and foods that they eat. Be thankful, as an educator to get the opportunity to engage in such meaningful conversations. Cultural competency builds bridges, so let’s openly travel across them. Here’s one last thing, a bunch of your students are listening to Bad and Boujee. Now you might not be rocking to this record but you better know who Migos are. To be a game changing and trill educator, being culturally competent and relevant is a requirement. We can’t be the old person on the porch, yelling at the kids to get off their lawn. Glover referred to Migos as the Beatles of this generation. As outrageous as that may sound to some, it’s important to understand what your students are into. Having some genuine knowledge in their interests will open doors. Don’t fake it either, because the young people can tell. So when someone say Rain Drop, be sure that you know what to say next. Congrats to Atlanta, now my fellow educators, go do the work. Despite her two losses, I think Ronda is still a great fighter and can still beat opponents. Unfortunately for her, it seems as if she’s only dominant one area; the arm bar. This is the devastating move where Ronda takes her opponent’s arm and bends it back until she taps out. I think the most disappointing thing about Ronda is that after taking a year off, it appears she had the same exact game plan that didn’t work the first time. She was trying to grapple a fighter that is known to attack with punches. Obviously, it appears she didn’t learn much from the first match. But I can relate in many ways. When I first started out as a Graduate Assistant, I was really good at one thing, using social media to help engage the student body. I was a marketing machine that connected with students and tried to instill excitement about events we were hosting. However, as social media become more popular and other departments started to use it I was stunted. I had to learn new ways to keep up with my competition. Which I in turn did eventually. Now that you’ve got a fresh semester and new year starting you’ve got to be ahead of the curve. Figure out how to improve on at least ONE aspect of your game. Think about what you would like to improve on and don’t wait for the moment that could potentially knock you out. If you want to become a better writer, write. If you want to be a better public speaker, speak. Being knocked down once is fine, but going down the same way twice means you were unprepared. I have to agree with Antonio here. “New” is an operative word. Time waits for no one and you better be ready for the moves. As a leader, it is imperative that you recognize the surrounding patterns and changes. Ronda Rousey’s amazing accomplishments helped take the sport to new heights. Unfortunately for Rousey, it seems as if the competitors have caught up and surpassed her in the skill level. If the students are not using Facebook or Twitter as much anymore then maybe you shouldn’t be on it as prominently. Adapting to the times means fully recognizing the pulse of the students. Who are their favorite DJ’s or what academic programs are people in most need or? As a leader, it is imperative to be ahead of the game. Assess every trend and see how that can help you reach audiences more effectively. Don’t get left behind by relying on old habits. Skill sets that once led the way won’t always lead to the win in this rapidly moving world. Ronda is a transcendent fighter, so up to this time whenever she stepped into the ring, it was a big deal. Every competitor at every step of the way wanted to bring her down but couldn’t, until someone did. Always remember that when you are great at what you do there will be those that will take extra time to study your every move. You have the choice to stay stagnant or keep improving and enhancing the skill set you have already developed. There will be This way when you are challenged you are ready for what is coming because you did the work. This year consider mastering the skill that you have become proficient or better yet learn a new one. During the fight, Ronda Rousey’s trainer is yelling out instructions. He’s telling her to move her head after she gets hit with a punch. He instructs her to clench after she gets hurt. Rousey just didn’t make the in-fight adjustments needed to win. As a leader and strong professional, it is important to make decisions on the fly. You should always be ready to adjust your plan if things aren’t going as planned. As a public speaker, if I recognize the audience isn’t feeling it, I can’t be afraid to switch up the game plan. You can have your strategy all set and ready to go, then something goes wrong. Maybe it’s a technology issue, perhaps there was a last minute change to a meeting; so now what? How will you recover? Former heavyweight boxing champion, Mike Tyson once famously said, “everyone has a plan, till they get punched in the mouth.” Life and leadership is full of punches in the mouth. Handle them with poise and proper planning. Be prepared for as many circumstances as possible. Go into every situation with a back up to the back up plan. Solving all challenges with the same approach can lead to frustrating outcomes. As you become more experienced and mature, you will need exceptional problem solving skills that include full examining every aspect of adversity. It is evident that Ronda underestimated her opponent because both times she fought using the same fighting style. She seemed to be more concerned with her own skills than her opponents which lead to two knock outs. In other words, Ronda attempted to solve the same issue using the same approach. Take the extra time to look over how you can solve the problem by asking your peers, mentors or writing down different options. Don’t approach issues with the mentality of “well we’ve always done this way and it never worked. Even if you are not successful you will be able to better justify your decision and move on to your second option. We are both rooting for you all as student leaders or professionals to have a productive new year and semester. Find ways to avoid the knockout and remain on top of your game. Challenge yourself and those around you to become the ones everyone looks up to, to make change. Soulja Boy and Chris Brown were involved in the first celebrity beef of 2017, my first question was whether or not Soulja Boy still made music. I thought I was in the know and down, but apparently not. (If you were wondering, he dropped a joint project with Bow Wow. Yes THAT Bow Wow). Anyhow, Breezy and Soulja Boy hit Instagram over these past 24 hours going back and forth at one another, throwing all the jabs. This really means so little in the grand scheme of things. Then I saw my students taking sides and commenting on various social media outlets. As my mom used to say, time for a lesson. If you’re an educator, here are some things you should be talking about with your students in regards to this. Most celebrity beefs usually involve one of these two factors. This oddly random issue between Soulja Boy and Chris Brown seem to be dripping in this. You ever soak a piece of bread into some gravy? I know some Haitians who have dipped that piece of bread into their soup joumou on New Year’s Day. This argument was double dipped in both pettiness and pride. I have seen this happen between a president and vice president of a club quibbling over who has power. Two fraternities are not cool with one another right now over something petty that happened at a party or step show from four years ago. Pettiness and pride have destroyed friendships and will hinder anyone’s development as a leader. The scariest thing about being petty is how easy it is to get into that space. The simplest action can have you reacting with silly anger or vengeance. Take the high road and live to fight the battle another day. You have many more important things to be concerned about. So from what I hear (from TMZ, Instagram and of course my students) this started because Soulja Boy liked and commented on a photo posted by Karreuche Tan, who is Chris Brown’s ex girlfriend. I won’t speculate but both gentlemen have mentioned her in their Instagram tirades. Sadly we see this type of behavior way too often. Two young men drag a young woman into an argument and as a byproduct she becomes a punchline. She becomes slandered just to help one or both guys advance their insults. Gender aside, we see this emotional abuse regularly between ex partners. I won’t speculate on the validity of these claims but I do know that Karreuche responded and has now found herself embroiled in this. Chris went right to back to Instagram and continued to take shots. This type of abuse seeks to humiliate others and attacks one’s self esteem. We’ve seen this maybe from friends or colleagues and many times have stood silent. It is essential to take these comments seriously and be as supportive as possible. This screams of ownership over someone. Comments like “all your friends are your friends because you was Chris Brown’s girl,” is a classic sign of co control. Things like this beef between Soulja Boy and Chris Brown seem like a joke but there are many underlying concerns within it. This phenomenon of taking it straight to social media or going to text just never solves all the issues. Apparently Soulja Boy also tried to Facetime Chris Brown or maybe it was Chris Brown who called first. Ultimately, it doesn’t matter. I don’t know how many times, I have had to step in and settle a disupute between two students who have yet to discuss an in issue they’re having in person. I’ll ask what happened and it’ll be, she texted me that, he tried to facetime this, her DM didn’t make sense, they were sneak dissing on Instagram or that emoji was disrespectful. I am all for new forms of communication but don’t rely on these apps to solve the problem alone. There is nothing like sitting in a room and hearing out the entire problem. It often eliminates wrong tones that get lost in text. Particularly with a mediateor in the room, it helps settle down tensions and you get to find some clarity to how the issues started and to how they can be solved. Chris Brown took to Instagram and said “Adrien Broner set up the gym, bro” Broner is a professional boxer, which implies Brown is ready to put some gloves on. Before this gets out of hand, I would love to see them really squash this nonsense immediately with no further repercussions. Hopefully guns don’t become the mediator in any of this as well. If not, the two getting in a boxing ring, throwing on some headgear is not the worst thing ever. It reminds of an old Family Matters episode, where Steve Urkel was learning to box, but I digress. As a student I am not recommending you take your all your issues into the ring, but I do suggest that a mediator be present, to help both sides facilitate the conversation. I really do hate that this is even an issue. These two artists should have never let themselves get this far. Some of your students may never even bring this up, but do know that many young people are online discussing it. Don’t be afraid to provide different perspectives to conversation.